This story is about GIA diamond grading and making sure you don’t get burned when buying your next diamond. Before we get into the story, we need to give you the background on the GIA. Established in 1931, the Gemological Institute of America (GIA) is the world’s foremost authority on diamonds, colored stones, and pearls. A public benefit, nonprofit institute, GIA is the leading source of knowledge, standards, and education in gems and jewelry. 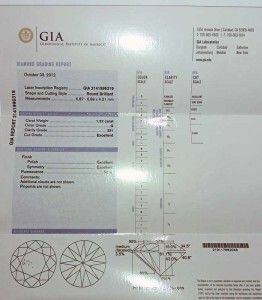 Trustworthy businesses adhere to the GIA grading system for diamonds and gems. A gentleman came into our store and we guided him through the process of doing a custom jewelry design together. We helped him select a gorgeous diamond and talked about the process of creating a custom setting. For this example, the gentleman wanted a 1.2 carat Round Brilliant Diamond, G color, SI1 clarity and we quoted him the price for a GIA certified stone. It’s at this point that you have to trust your jeweler. Our potential client went out and bought what he thought was the same quality of diamond from someone else. He brought it into our store to have us complete the custom portion of the project. It turns out that his stone was an EGL certified diamond that wasn’t even close to the quality of the GIA certified diamond that we presented. He “saved” a few hundred dollars, but in reality, he was taken advantage of. He paid more than he should have for a poor quality stone. If he would have trusted us and asked for other options, we could have helped him find a better solution for his budget. Did you know that you can look up the GIA report on any stone they’ve certified? The stone we’ve been talking about is report #2141996319. All you have to do is click on this link to see all the details. So the moral of the story… go with GIA certified diamonds. And find a jeweler you can trust! If you have an Angie’s List account, be sure to check out our consistent A rating since 2012!